Hi everyone! So one of my favorite new cards from Rise of Shadows is Conjurer's Calling. I've been having success with summon mage against control warrior but run into difficulties when facing aggro decks. 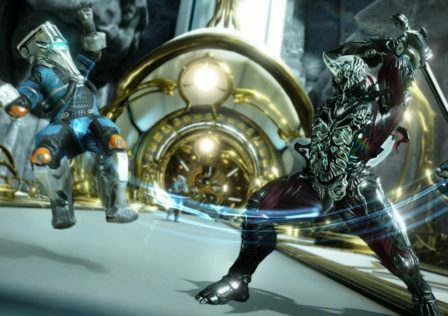 There are certain times where you will need to play Conjurer's Calling on a minion in the hopes of summoning either a taunt, rush, or charge minion in order to stay alive. So I figured it would be nice to know the probabilities of hitting one of those mechanics, so we can play Conjurer's Calling with the best chance of success. This was all done with standard play in mind but the same thing could easily be done for wild calculations. 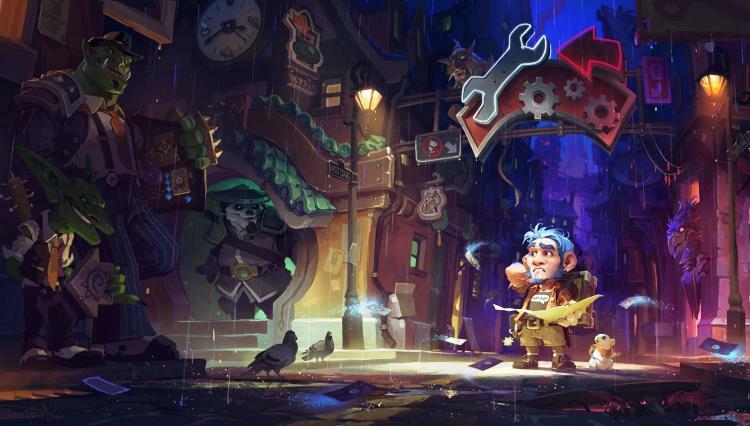 So we want any of those first three outcomes where we get a taunt (or Rush or Charge) minion. 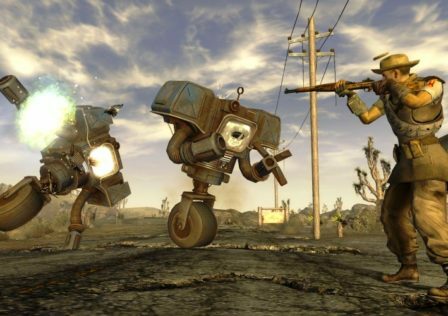 Adding up the probability of the first three gives us our percent chance of landing the type of minion we want. An interesting side note is that since Khadgar summons a copy of these two minions, having Khadgar on the board does not at all affect your probability of getting a taunt/charge/rush minion. 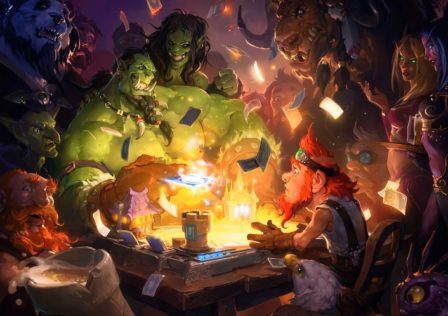 Read: 18 Decks to know for the January play season. So here is the table for taunt minions. This does not include minions that generate a taunt or transform into a taunt (like Druid of the Claw or Ancient of War). If you have survived to the late game against aggro, you probably aren't too worried about getting a taunt minion so I am generally more concerned with the lower mana costs. Mountain Giant is always the best option if you can cheat him out early with a large hand size as Grave Horror is the only other 12 mana minion. When playing Conjurer's Calling on Mountain Giant, your odds of at least one of the two generated minions being Grave Horror is 75%. It's worth noting that if you are forced to choose between conjurer's calling a 1 mana minion or a 2 mana minion, the 1 mana will land you a taunt 13% more of the time. If you can make it to 4 mana you will essentially get a taunt one out of every five attempts. At five mana you will land a taunt one out of every four attempts. 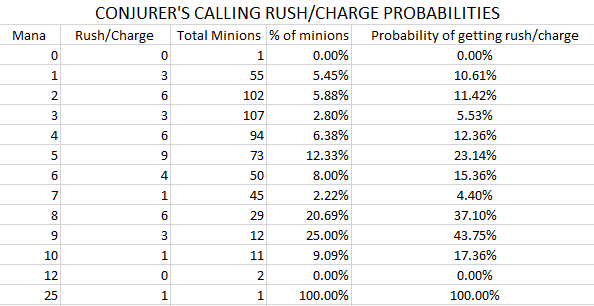 The table below shows the probabilities of getting a rush or a charge minion. Similar to taunt, this does not include minions that have battlecries that give them rush (like Scaleworm). Houndmaster Shaw is included because summoning Houndmaster Shaw gives one of our minions rush which is one of the desired outcomes. If you have Shrivallah, Play Conjurer's Calling on Shrivallah. If you are concerned with aggro, 5 mana is once again the sweet spot and you could possibly high roll and hit a minion with rush/charge and taunt (hello Zilliax). Late game, 8 and 9 mana are your best bet to hit a rush or a charge minion (Alakir, Gromash, King Krush, Burly Shovelfist). 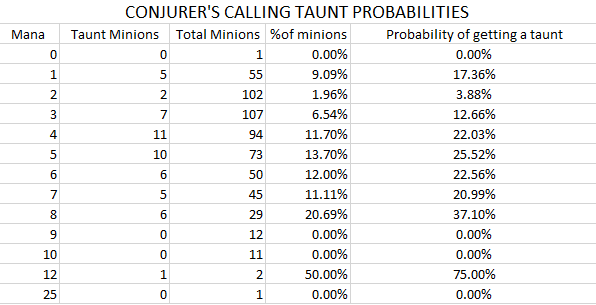 © Post "Conjurer’s Calling Probabilities" for game HearthStone.